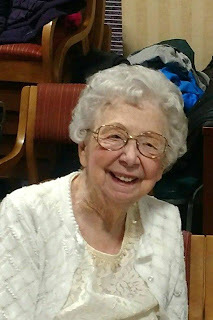 My Mother, Dorothy Hunter was buried last Wednesday. She was 100 years old and in good health until she caught the flu and pneumonia. It is very hard to believe she is gone. We have finished cleaning out her apartment, taken the clothes to the Salvation Army, and given various pieces of furniture away to other family members. As we went through her things we found items we would love to talk to her about. Where did this come from? We found love letters from Dad, ration books from the war, and her typing and shorthand certificates. I will miss her a lot. Ahhh, Love this post. Especially the love letters and the war ration books. Excellent post. I will miss her too.